What makes a good citizen? What are educators trying to accomplish with “citizenship” education? 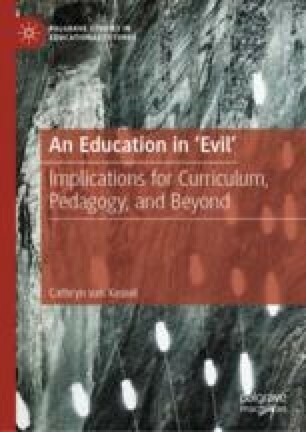 This chapter engages with a supplement to citizenship educationthrough Alain Badiou’s identification of three processes of evil: betrayal, simulacrum/terror, and disaster. According to Badiou (Ethics: An Essay on the Understanding of Evil. Verso, London, UK, 1993/2001), evil is not something that exists on its own; rather, evil is a failure of the good. He defined evil as the result of humans failing or perverting a truth procedure (i.e., the activity of an emerging truth). Individuals and societies need a set of ethics to help create a world with less evil—to persevere in goodness—despite the established order of things that might discourage them. den Heyer, K. (2014, September 14). Badiou and the educational situation. Politics and Culture. Retrieved from https://politicsandculture.org/2014/09/01/badiou-and-the-educational-situation-by-kent-den-heyer/. den Heyer, K., & Conrad, D. (2011). Using Alain Badiou’s ethic of truths to support an ‘eventful’ social justice teacher education program. Journal of Curriculum Theorizing, 27(1), 7–19. Retrieved from http://journal.jctonline.org/index.php/jct/article/view/302/95. den Heyer, K., & van Kessel, C. (2015). Evil, agency, and citizenship education. McGill Journal of Education, 50(1), 1–18. Retrieved from http://mje.mcgill.ca/issue/view/556. Hallward, P. (2013, July 22). Radical thinkers: Alain Badiou’s ethics—Video. The Guardian. Retrieved from https://www.theguardian.com/commentisfree/video/2013/jul/12/alain-badiou-ethics-video-radical-thinkers. Office of the High Commissioner for Human Rights. (1948). Universal declaration of human rights. Retrieved from http://www.ohchr.org/EN/UDHR/Pages/Language.aspx?LangID=eng. United Nations Office on Drugs and Crime. (2013). Human Trafficking. Retrieved from http://www.unodc.org/unodc/en/human-trafficking/what-is-human-trafficking.html.